A single or legally separated individual who has a child, legitimate, illegitimate or legally adopted, is entitled to a basic personal exemption granted to a head of family. He/She is entitled also to an additional exemption of P8,000 per qualified dependent (not exceeding four). 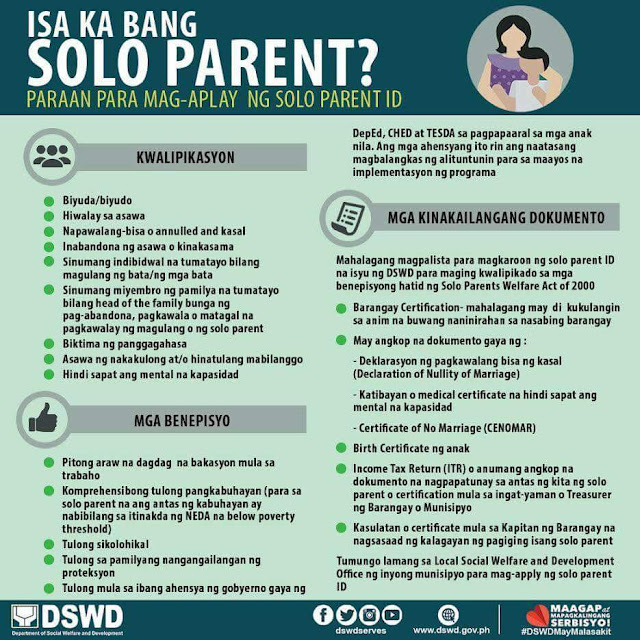 A solo parent is not entitled to the above additional exemption if he/she takes care of a person with disability who is not his/her child, unless he/she legally adopts the same. Under Republic Act No. 8972, the state is duty-bound to provide comprehensive program of services, benefits, and privileges for solo parents and their children. KUNG pasok ka sa banga, huwag ng magpatumpik-tumpik pa at tumungo sa Local Social Welfare and Development Office sa inyong munisipyo. Visit www.dswd.gov.ph for more info.